This week at HP Discover, HP introduced a new Remote Copy mode along side of its new 20800 series high-end arrays. The new mode is Asynchronous Streaming Remote Copy and it intends to provide higher recovery point objectives (RPO) for replication for extended distances and constrained bandwidth between datacenters. In addition, Asynchronous Streaming also has performance gains with replication between all-flash arrays where the added latency of synchronous replication is undesirable. The new replication mode allows changes to be streamed much the same as synchronous replication with the major difference being that the remote writes are not acknowledged before the source arrays acknowledges the write to the host. The RPO for synchronous replication is realtime and the traditional 3PAR Asynchronous Remote Copy is on 5 minute intervals. 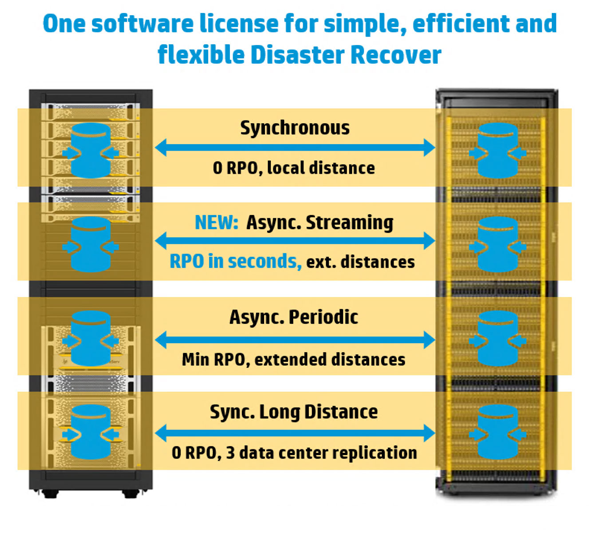 Asynchronous Streaming allows for a near real-time RPO – HP is advertising an RPO of seconds – while adding no latency to the host access on the primary array. According to HP’s marketing materials, they have found that synchronous replication can make up to a 5x hit on performance in all-flash arrays. While 1 to 2 milliseconds of latency was more than acceptable on spinning disk, flash storage has significantly changed the landscape. Customers who are purchasing all-flash arrays are attempting to gain as much possible performance from their arrays. Asynchronous streaming replication improves the position where performance really counts and is engineered towards the performance use case. One example of the engineering to performance comes in the handling of write bursts – or periods of high writes that need to replicated to the remote system. The 3PAR arrays will cache the writes to be made up until it exhausts the available cache. Once cache is exhausted, it will pause replication, snapshot and then resync the volume and atempt to restart streaming. While the resync is occurring, if cache is exhausted again, it will stop replication without an automatic restart. This is all done to preserve the best possible performance for the host. The chart below from HP shows the use case along with the latency requirements and RPO’s achievable from each of the 4 modes of Remote Copy now available. Asynchronous Streaming Remote Copy along with the other new software features are only available on the HP 3PAR StoreServ 20800 series arrays at this time. Disclaimer: HP invited and paid for my trip to Las Vegas to attend and learn at HP Discover. The views and opinions are my own. With change constant, where is HPE going?